For a variety of reasons, however, including mental health challenges, veterans are at risk of family instability, elevated rates of homelessness, and joblessness. More than half million veterans in the United States are homeless at some time, and on any given night more than 300,000 are living on the streets or in shelters. Veterans are twice as likely as other Americans to become chronically homeless. Conversely, while veterans represent one in 10 adult civilians, they account for one in four homeless people. Although lack of education and limited transferable skills from military to civilian life are significant causes of these problems, physical and mental health problems (and lack of care for those problems) are also factors. Veterans have disproportionate rates of mental illness, particularly posttraumatic stress disorder (PTSD), substance abuse disorders, depression, anxiety, and military sexual trauma. Nearly 50% of combat veterans from Iraq report that they have suffered from PTSD, and close to 40% of these same veterans report “problem alcohol use”; in addition, according to estimates from 2010, approximately 22 veterans died as a result of suicide each day in that calendar year. Studies indicate that 56% to 87% of service members experiencing psychological distress after deployment report that they did not receive psychological help. In fact, results indicate that 44.5% screened positive for clinically significant symptom clusters consistent with one or more mental disorders. This proportion appears significantly higher than previous research and comparison to diagnostic rates for the general population, in which estimates range near 10.5%. The study also revealed some significant differences between public safety categories in frequencies of positive screens that warrant further investigation. For example, when comparing the data between paramedics and firefighters, the study found higher rates of PTSD (24.5%), depression (29.6%) and panic disorder (10.3%) among paramedics. The results also indicated that rates for these same mental health measures were lower for paramedics when compared to corrections officers where PTSD (29.1%), depression (31.1%) and panic disorder (12.2%) were all higher. Our goal is to heal trauma and allow our military, both active and veterans, as well as first responders, be able to develop resilience in their brains so that they can live a full life. This includes a goal to intentionally save lives, save marriages, keep families together and allow for continuation in a career for those who want to continue serving. Equine Therapy is a proven scientific based modality for the treatment of trauma. Our licensed and certified teams work with members of the military, first responders and their families. 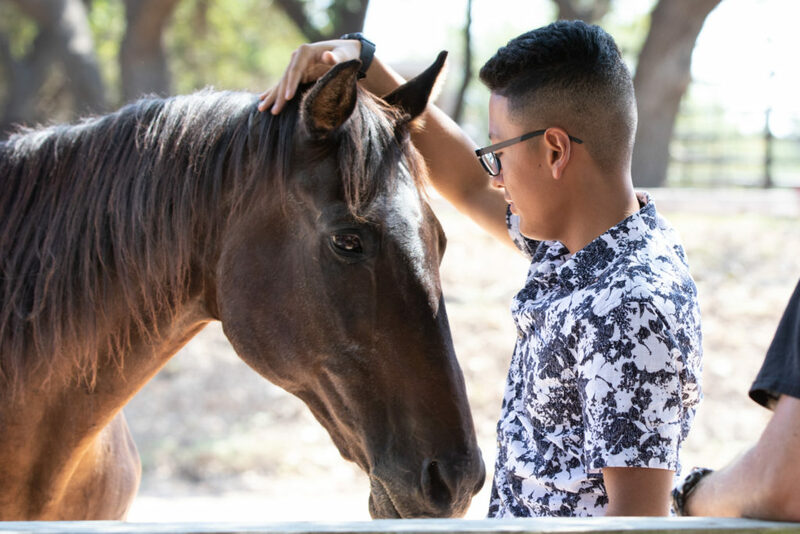 Our therapy model is goal focused, set in the outdoors and partners with horses and mother nature to process trauma and allow for healing. The model we primarily practice is through the Natural Lifemanship Institute. We bring this life-changing service to our communities at an affordable cost by asking our donors to fund the sessions specifically to provide only the highest level of professional mental health services, by a team of highly trained, licensed and passionate therapy teams, safe and healthy horses, a beautiful peaceful and safe environment with every effort made to maintain confidentiality and anonymity. Our donors provide for the majority of the cost, so it is affordable and accessible.